I wrote last week about the new Starbucks stealth cafés that are springing up in Seattle, and as an afterthought added that Opposite in the Victoria Quarter probably serves the best coffee in Leeds. This doesn’t do Opposite justice. Opposite’s original branch is opposite the Parkinson building at the University of Leeds, tempting academics out of the depths of the glorious Brotherton Library for a quick break from the books since 2005. The recently opened Victoria Quarter outlet is one of those Tardis-like kiosks in the middle of the arcade, a small place that revolves around an impressive and no doubt very expensive espresso machine. It marks a bold move into the very heart of the city, straight onto it’s upmarket high street with some heavyweight competition from Harvey Nichols on one side and Anthony’s on the other, both of whom know a thing or two about good food and drink. The coffee menu has the usuals – latte, cappuccino, espresso – but it’s the presence of the little known but very serious ristretto that makes the passing coffee connoisseur pause. A ristretto is an extremely short cup of espresso. Only the first ounce and a half of hot water are drawn through the coffee grinds, creating a powerful and concentrated mouthful of coffee. Nothing more, just a taste, but the taste of a true cup of coffee. It’s a magical drink. Opposite’s espresso is made from 80% Columbian and 20% Guatemalan Arabica beans at the moment, but they use four different ‘seasonal’ blends depending on the quality of beans available and the time of year. All the coffee beans are ground to order, for each cup, which helps to capture the freshness of the bean. Making a good shot of espresso is not easy, and there’s plenty of scope for tiny errors that can destroy the taste of the finished drink. I watched the barista carefully as he made my shot. He ground the beans and measured the exact amount of coffee into the hopper, wiping the rim and tamping it down in a practised move he’d clearly repeated thousands of times. He loaded the hopper into the machine and sent the steam through. The coffee started to drip into the warm cup below, then it started to flow more steadily in a thin, dark stream. The barista didn’t take his eye off the stream of coffee once. The espresso was pulled with care and real attention to detail, and this care showed through in the taste. The espresso is exquisite. Smooth, velvety, bitter and deep with a rich, almost chocolate like flavour. It really is good. Milk based drinks are poured with the type of flourish and attention you just won’t get from a high street chain. The pattern on top of a cappuccino is a work of art. Opposite deserves to be successful, and it will be. The quality of their coffee is simply just too good for Opposite to become anything less than a complete triumph. Katie, the prices are excellent. 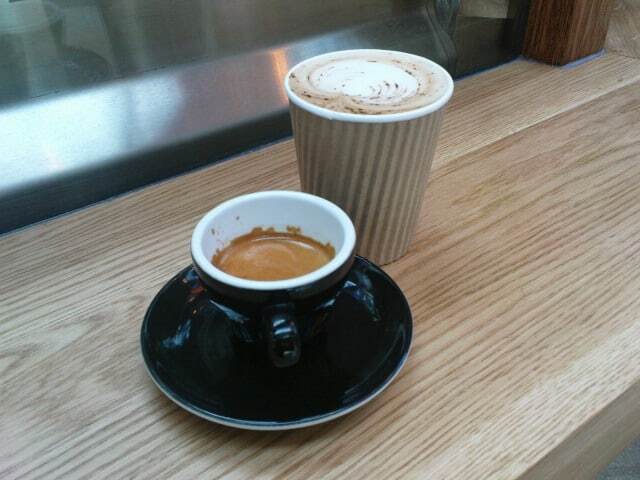 My double espresso on Saturday cost £1.50 and was far, far better than anything from Starbucks. They have ristretto on their menu?!?! That may just be my ideal spot! It's so hard to get baristas to understand the ristretto concept, I'm glad to see some coffee shops have embraced it! Thanks for the informed review. Since enjoying fine espresso and proper cappucino on Milan, I've been on the hunt for decent coffee served by baristas who know what they're doing on my home ground in West Yorkshire. I'll definitely five Opposite a try the next time I'm in the Victoria Quarter in Leeds. Great website by the way (just discovered it)! Visited opposite for the first time today on the strength of the reviews here. This will be my regular place for a double E!